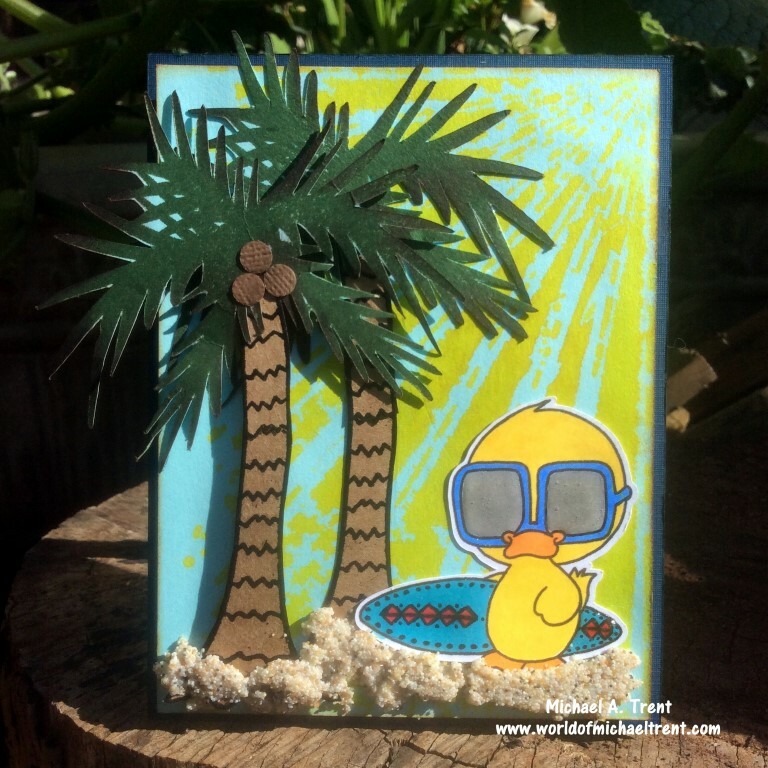 This project all started when I got an email from Gerda Steiner Designs asking people to download a free digi of a surfing duck, make something with it, and upload it to the Instagram Surf Challenge. Um....sure! 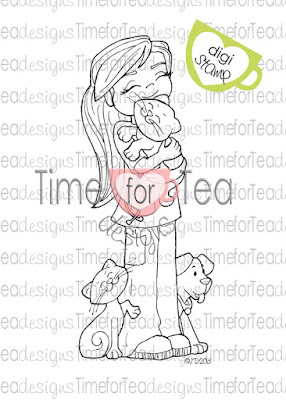 Being in Brasil, without easy access to a stamp store, has made me embrace digi stamps a lot more than in the past. 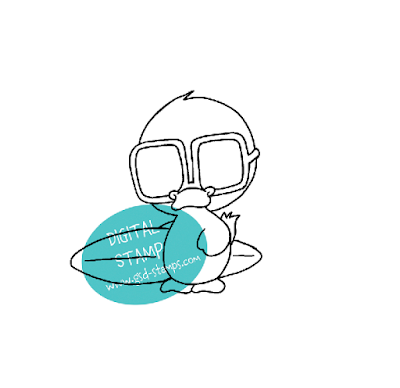 So I went HERE and downloaded the free Surfing Duck digi, below. Oh, I named him Sam, by the way. Sam the Surfing Duck! I started with an A2 side folding white cardstock base. 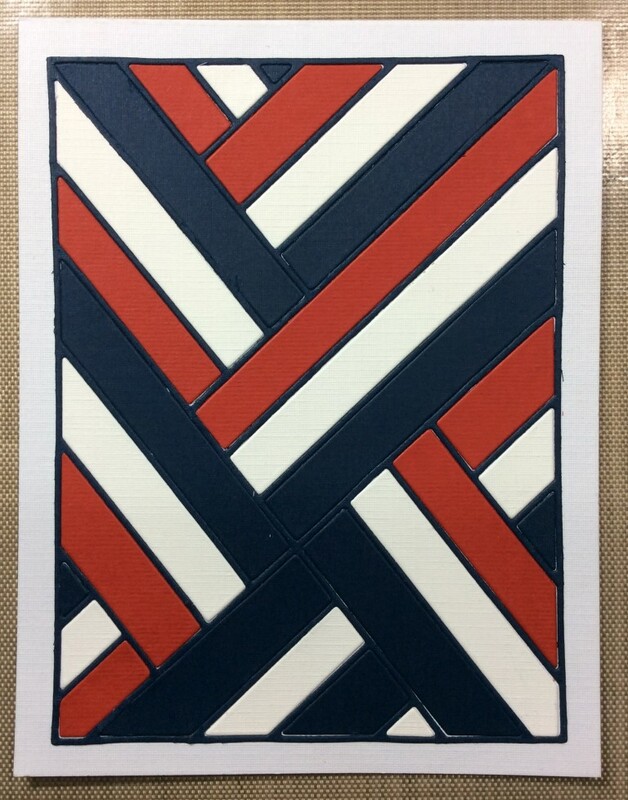 I cut a piece of navy blue cardstock, 4 1/4" x 5 1/2", which I adhered to the card front. 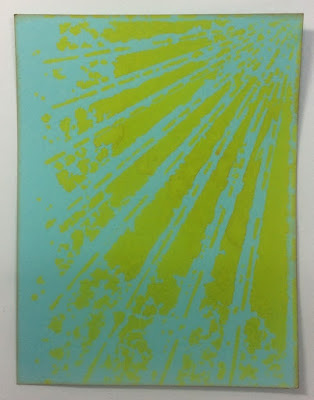 Then I cut a piece of light blue cardstock, 4" x 5 1/4", placed the "Shine" stencil by Memory Box over the cardstock, and sprayed it with Lemon Zest Dylusions ink spray. For the palm trees I used a set called "island2visit" by The Stamps of Life. I wanted the palm trees to be taller than the stamp allowed so I stamped and embossed the truck, twice, and then I cut a piece off one of the trunks to glue at the top of the other. I did this twice since I wanted two trees. I also stamped the leaves stamp twice and had my Scan N Cut cut them out. 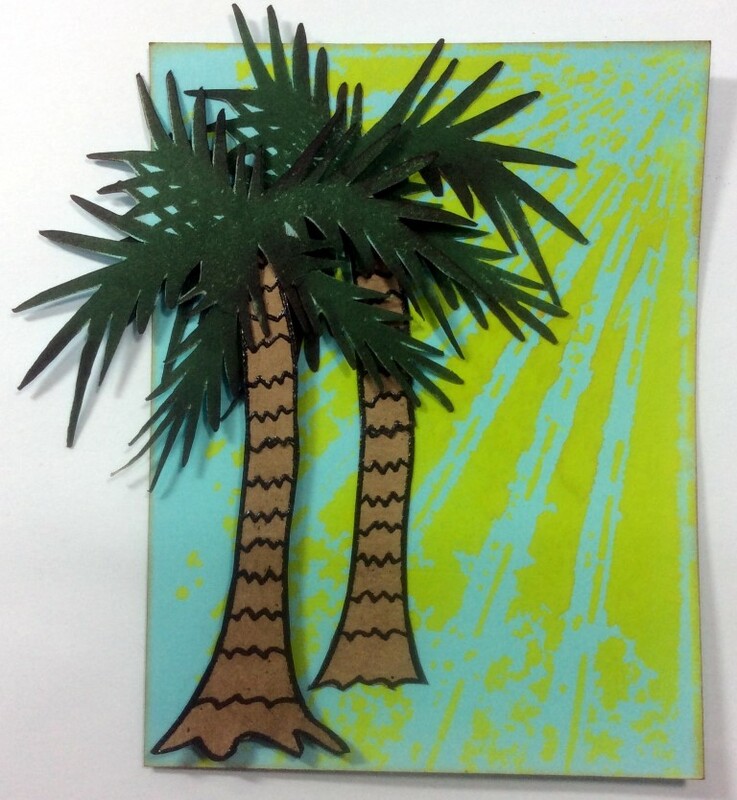 Then I adhered one of the trees onto the card front as well as the leaves at the top. 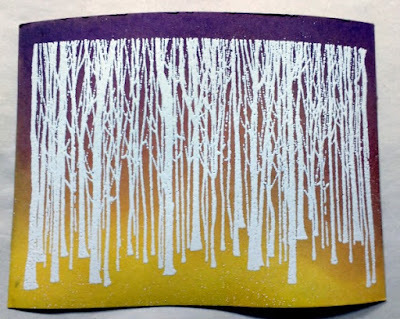 For the 2nd tree, I put some pop dots on the back of the trunk and the leaves and adhered this to the card front but on the left side of the first tree. 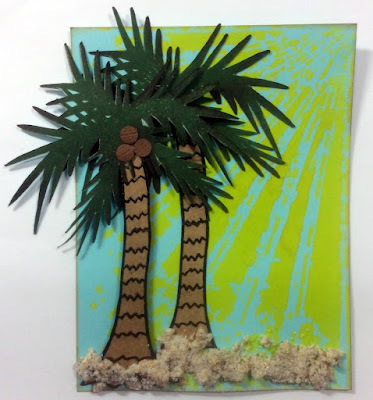 I wanted some sand on the bottom of the card so I dug through my stash and found a jar of Malibu Beach sand with glue from MuddPuddles, which I think is out of business now, and applied some of this to the bottom of the card front. 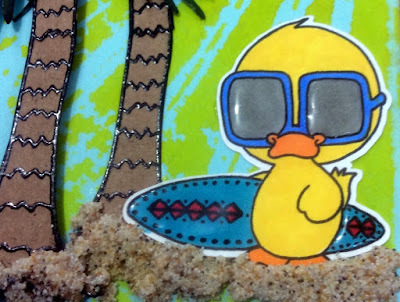 Then I colored in the Sam the Surfing Duck digi with some Copic markers, added a few dots and dashes to his surfboard to give it a slight design, and applied glossy accents to his sunglasses and the surfboard. 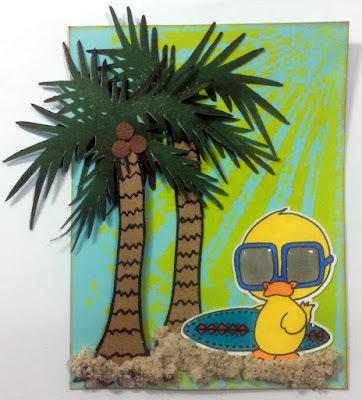 After it was dry I adhered Sam the Surfing Duck next to the trees. I hope you guys enjoyed this quirky little card. It was fun to make. 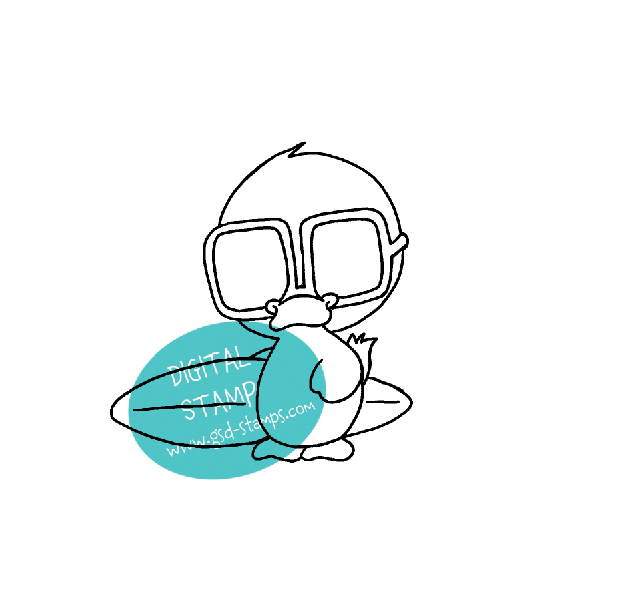 If you want to make something too, click on the link at the top to get the digi or sign up for the newsletter on the blog HERE! TGIF!! I cannot believe that I woke up at 6:30 a.m. with enough energy to light the town for a month. LOL. Of course I lost all my energy when I found out that the UK decided to leave the EU. The markets will tumble today, the media will talk to us about end times and, in a week, all will be back to normal. 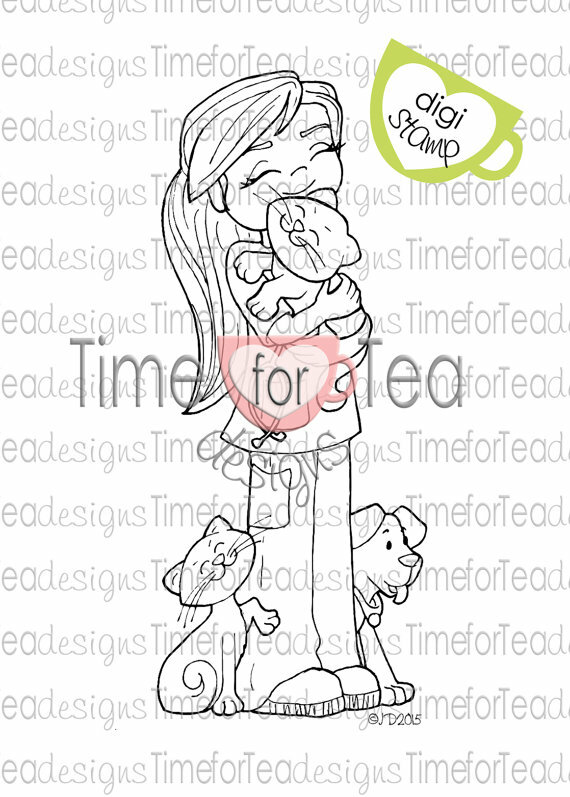 But I will just make the most of it and make cards and color. 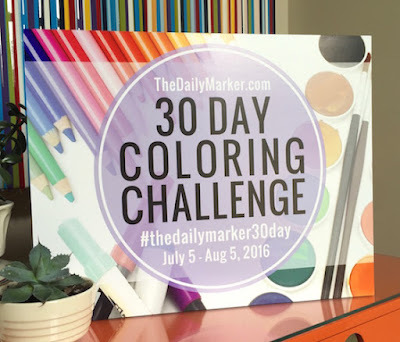 Speaking of coloring..... Kathy from The Daily Marker is having her next 30 Day Coloring Challenge July 5th to August 5th - and I cannot wait!! This is a great challenge and I really suggest people play along with her. 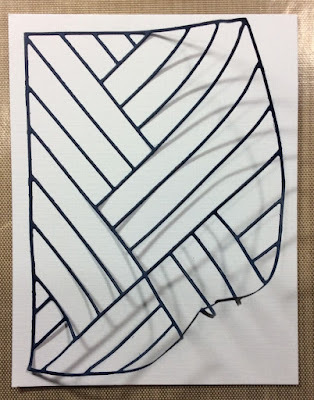 There is no stress with this challenge - other than to try and color something - it can be a small little image to a giant full page - at least once a day for 30 days. If you want more info on the challenge you can click HERE to watch Kathy's video. I hope you will be joining me. Today's card is my 2nd card in honor of July 4th or Independence Day in the USA. 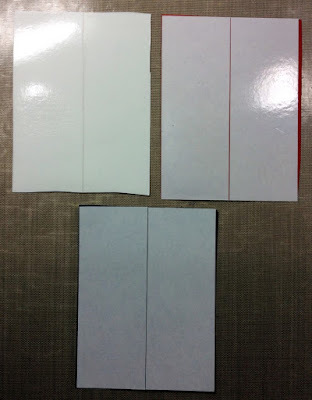 I started with an A2 side folding white cardstock for the card base. Then I cut a piece of red textured cardstock, 4 1/4" x 1 3/4", and adhered it to the bottom of the card front, and a piece of decorative paper with a red, white, and blue theme, 3 3/4" x 4 1/4", and adhered this above the red cardstock. 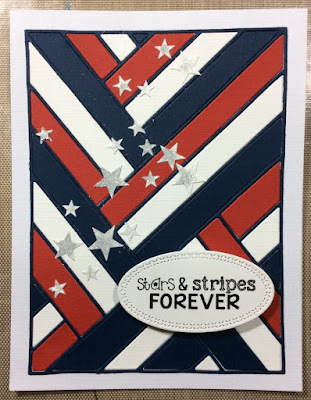 Then I took one of the phrases from "Stars & Stripes Forever" by Unity Stamp Co., inked it up with Versamark ink and heat embossed it with white embossing powder - on the red cardstock. 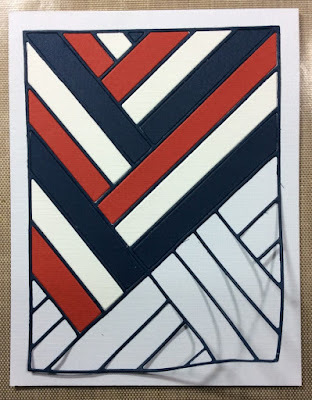 Next I used the Stitched Jumbo Fishtail Banner dies from My Favorite Things and cut a piece of white cardstock with the 3rd largest die and a piece of navy blue cardstock with the 4th largest die. I distressed the edges of both and adhered the white to the navy blue cardstock. Then I put some pop dots on the back of the navy piece and adhered this to the card front, above the embossed phrase. Then I stamped the image from the same set (twice) with Memento Tuxedo Black ink and color it in with Copic markers. I went over the blue and red areas with a Clear Wink of Stella Brush marker to give it some shimmer. I cut the heart out and adhered it to the center of the white cardstock. 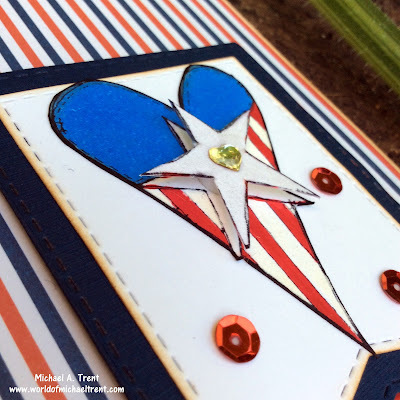 Then I cut the star section from the 2nd image I stamped, colored it with the Clear Wink of Stella marker, put a pop dot under it and adhered it to the center of the heart. Lastly, I adhered a few red sequins near the heart and I adhered a clear heart to the center of the star. Done!! Here are some close ups of the image and the star. Labels: Card, July 4th, Unity Stamp Co.
Summer is HERE!!! 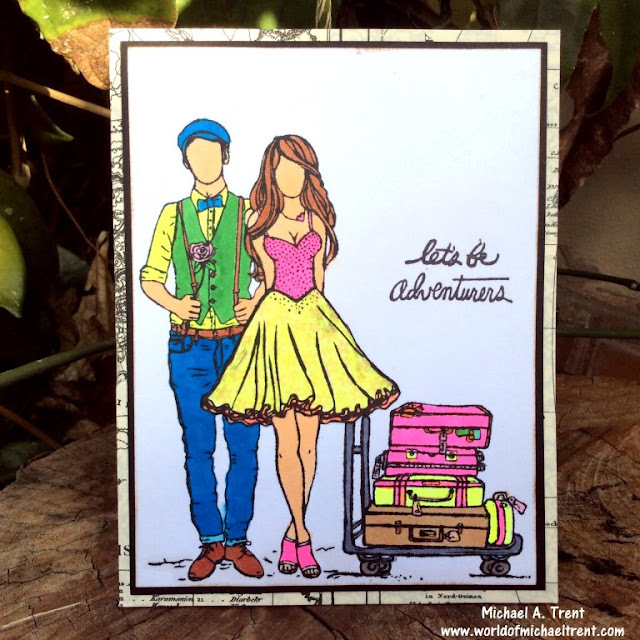 Let's Be Adventurers! Good morning everyone! According to the reports last night we were expecting torrential rains lasting through today. They were wrong! They must have passed us by because it is bright and sunny outside! I am working on a huge "scene" project but will need to take a break soon so that I can take Max or Bandido on a very long walk. 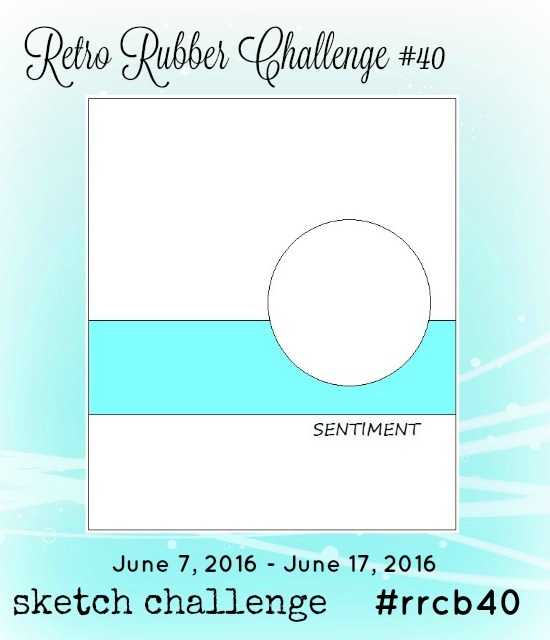 Today's card was made at least two months ago and I have no idea why I never blogged about it. I really love how it came out. I'm not happy with where I put the sentiment but I can deal with it for now. All the stamps used on the card are from Unity Stamp Co. The couple on the card front are George & Scarlett. They have been married for 5 years now. Scarlett met George at his restaurant where he is the chef. She not only fell in love with the decor, the food, and the wine...but also with George. After they got married she started her own clothing line. As you can see from her ensemble, she loves bright colors. Well, now that her line has taken off and George's restaurant is so successful, she decided to surprise George with a trip to Spain, and this is the card she gave him. LOL. 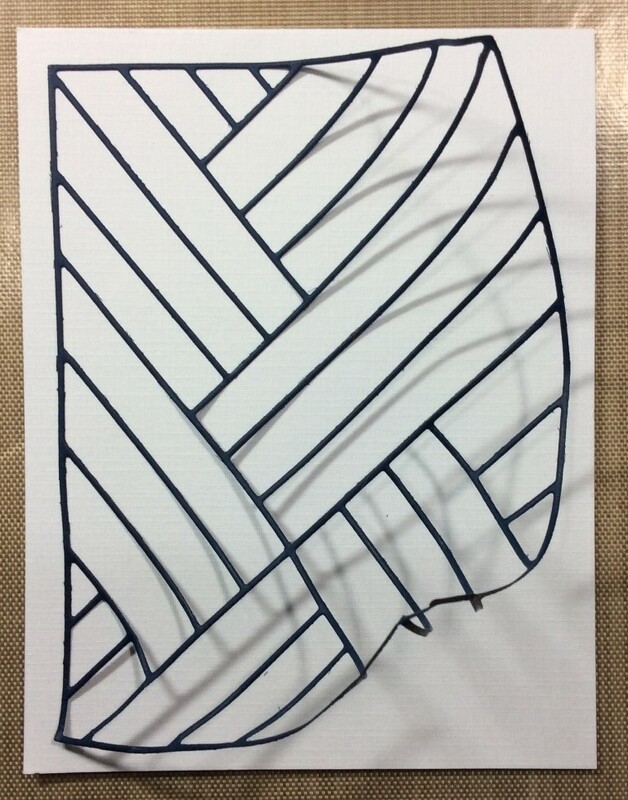 To make the card I started with a piece of white cardstock, 3 7/8" x 5 1/8". I stamped the cart with all the luggage on it (from the Let's Be Adventurers set) on the right side. Then I stamped George & Scarlett (from the George & Scarlett set) next to the cart. I colored George & Scarlett with various Copic markers. When done, I felt that Scarlett was not as exciting as George. So I stamped her skirt again on a piece of decorative scrap paper that had a flower pattern on it, went over it with a bright yellow Copic, cut the skirt out, and layered it over the original skirt. Lastly I stamped the phrase, also from the Let's be Adventurers set, on the right side. Then I layered this onto a piece of black cardstock, 4" x 5 1/4", which I then layered onto a piece of decorative scrapbook paper of a map, 4 1/4" x 5 1/2". Done! Both of these sets are designed by Angie Blom for Unity Stamp Co. She has a HUGE series of "AngieGirls" stamps and I wish I could own them all. They are also all on sale right now for $10 each. I don't make anything by promoting this...just passing great info along. Hello everyone. Hope y'all are having a good week so far. I was not feeling great this past weekend so I chose to chill and catch up on some of my shows. 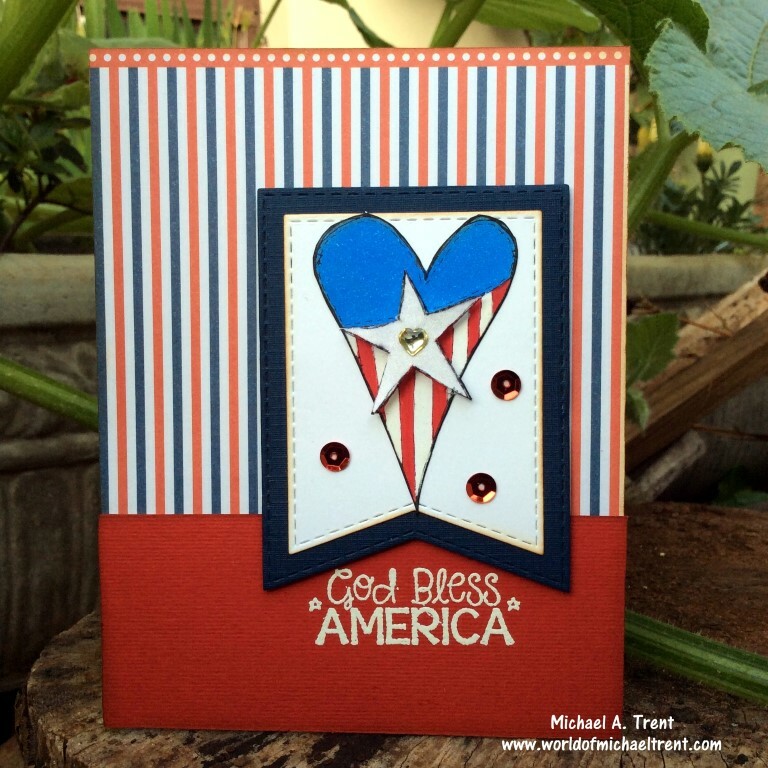 I am feeling better this morning and got the idea for this card after I saw the trailer for the new "Independence Day" movie coming out. The first movie is one of my favorites and, as much as I know the new movie will probably disappoint, I cannot wait to go see it on Thursday! To celebrate....I made a card for July 4th! 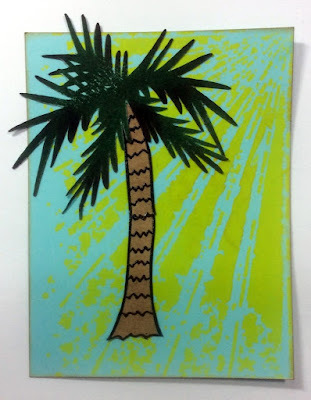 I am using one of my favorite dies - Woven Ribbons Card Panel by Frantic Stamper. I have also used it HERE. To start, I cut a piece of textured red, white, and blue cardstock - just a bit larger than the die. 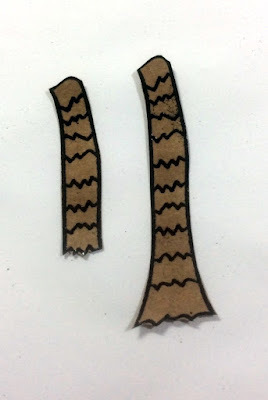 Then I applied 2" wide double sided tape to the back of each piece and burnished well with a bone folder. Using my die cut machine, I die cut each of the pieces with the Woven Ribbons Card Panel die (use a metal adapter plate for a better cut). The red and blue show the front of each piece. The white shows how the back of the piece will look. 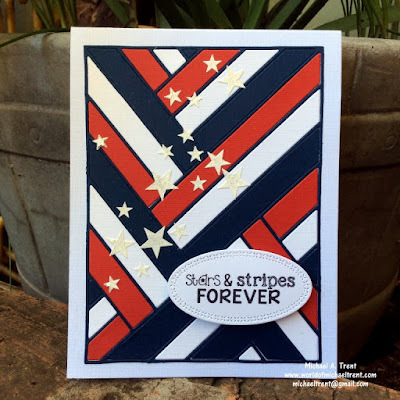 Remove the outside border from the piece of blue cardstock and, working slowing, adhere just the upper corner of the piece to your card front. You DO NOT want to adhere the whole piece. 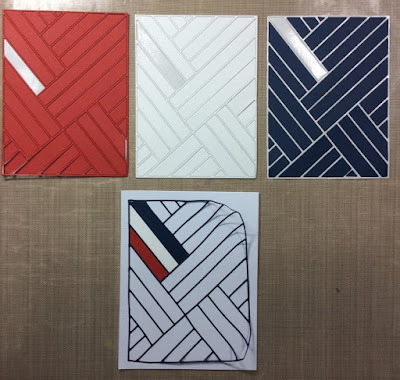 Most of the sections of the die have 3 parts so I envisioned them as red, white, and blue. I place the 3 pieces of cardstock above my card front and, starting with the red of one section, I just started to fill in the card front. It's like a puzzle. And because we used the double sided tape on the back, all you have to do is remove the tape backing and insert the piece into the correct space. Then burnish. Then I moved to the next section. 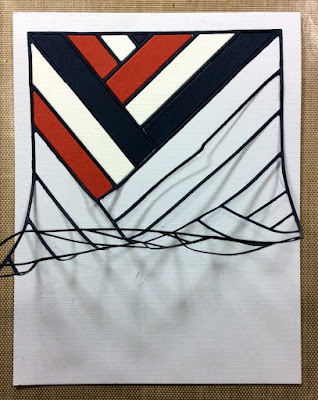 As I fill in each section, I move the border so that it is perfectly aligned with each piece. This is why I do not adhere the whole border at once - you have no wiggle room. The card front completely filled in. Once I had the whole card front filled in, I grabbed my Heidi Swapp Confetti Stencil, placed the stars where I wanted them and applied some Glossy White Embossing Paste with a palette knife. 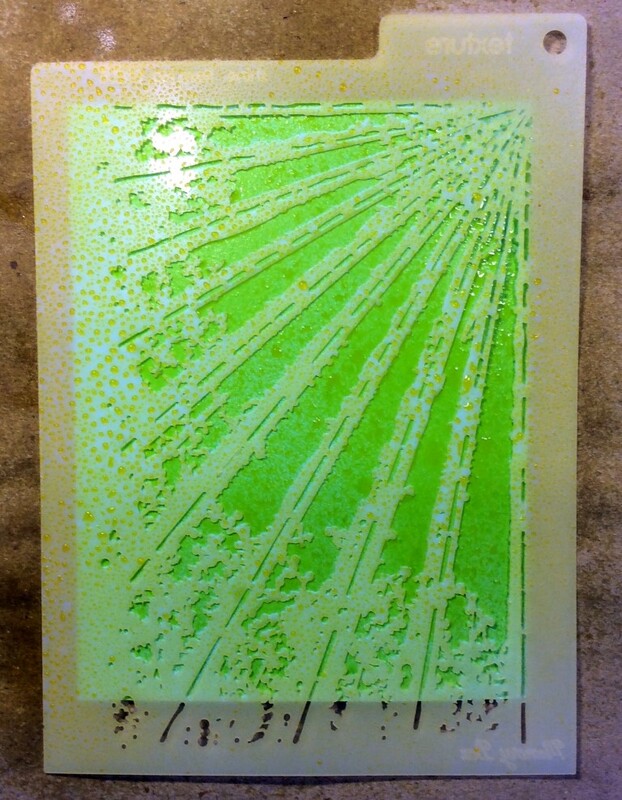 I removed the stencil (clean the stencil and knife immediately) - and felt there was too much white. So I covered the stars some silver fine glitter. 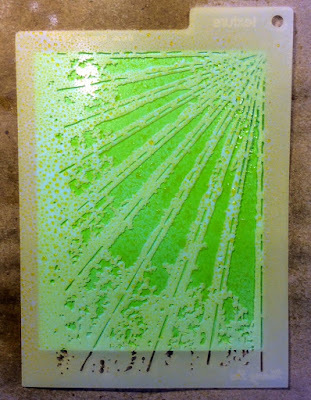 Once it all dried, most of the glitter came off but I liked the simple shimmer to the stars. Last thing I did was to stamp the phrase from the Stars & Stripes Forever set by Unity Stamp Co. on to white cardstock and die cut it using the X Stitched Oval Dies by Gina Marie. I put 2 pop dots behind the oval and adhered it to the card front. 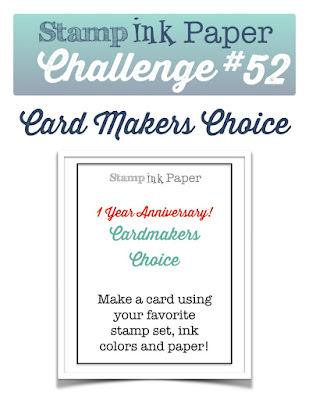 Labels: Card, Frantic Stamper, July 4th, Unity Stamp Co.
And, not only do they have a blog hop happening but you can also win a few goodies! I hope you can check all the posts out, show all the designers some love, and enter a card or project into the challenge. and then I searched a bit more and found THESE digi papers, which I knew would go perfect with the image of the vet. To make the card I started with a 5" x 7" Kraft card base. Then I printed one of the digi papers, trimmed it to 4 3/4" x 6 3/4", distressed the sides, wrapped a piece of red ribbon around it, made a knot, and adhered it to the card front. After this I printed the digi image of the Vet, 4" high, and colored her in with some Copic markers. Then I trimmed the image to a strip 2" wide by 6 3/4" high, which I adhered to another piece of Kraft cardstock, 2 1/4" x 6 3/4", distressed the sides and adhered this to the card front. Then I adhered a few sequins to the front and "Happy Birthday" to the inside. Done!! Hello everyone. It seems my mojo is certainly flowing this week! I think it's because it's so cold here this week! Woke up to 40F (7C). I'm not happy but it is supposed to get warmer this weekend. I've had a few sets from Reverse Confetti sitting around for over a year that I have been wanting to get dirty. As soon as I saw this sketch, this card idea popped into my head. I started with a top folding A2 white card base. To the front of the card I adhered a piece of scrapbook paper, 4 1/4" x 5 1/2", from the Hootenanny Six By Six pad by My Mind's Eye. I loved the reverse side and had enough left from the same sheet to cut the strip, 1 1/2" x 4 1/4", which I adhered across the card front. Then I stamped the phrase from Later Alligator by Reverse Confetti under the strip of paper. Then I die cut a piece of complimentary paper with the larger scallop die from Circles 'n Scallops Confetti Cuts by Reverse Confetti, which I adhered over the strip. 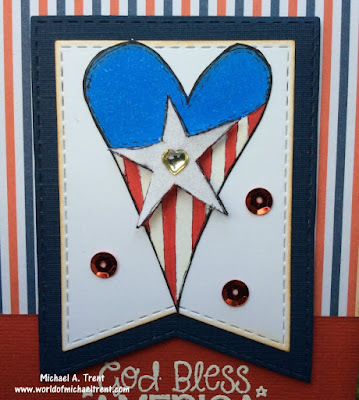 Then I cut a matching circle die from the X Stitched Circle Die Set by Gina Marie Designs and adhered this in the center of the blue scallop. Next, using Memento Tuxedo Black ink, I stamped the alligator on to green cardstock, and the bow tie and cake onto white cardstock. 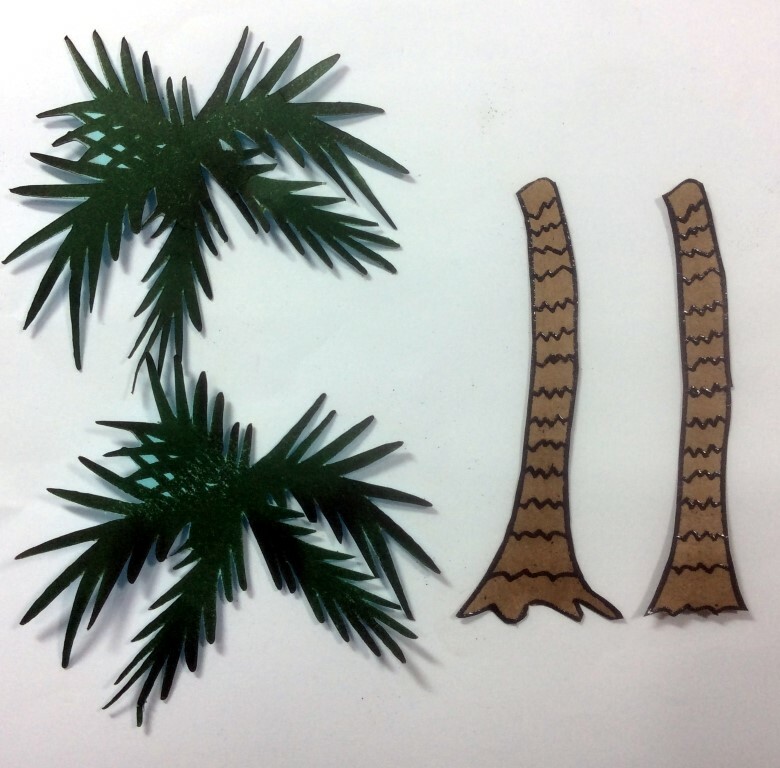 All 3 images come from the Later Alligator set by Reverse Confetti. Then I die cut the alligator and cake using the matching Later Alligator Confetti Cuts and I hand cut the bow tie. I colored in the cake with Copic markers - Y08 and B05, and the bow tie with Copic B05 also. Glued the bow tie onto the alligator and then placed some pop dots behind both pieces and adhered them on top of the white circle. Using Memento Tuxedo Black ink, I stamped the balloons from Monkey Business by Reverse Confetti and then die cut them using the matching die - Monkey Business Confetti Cuts. I colored them in with Copics Y08, B05, R27, and FYR1 and adhered them behind the alligator but made sure to make it look as if he is holding them in his paw. The last steps were to adhere two googly eyes to the alligator, apply Glossy Accents to the front of the balloons, Wink of Stella Clear Brush to the cake and candle, and Espresso Dimensional Pearls by Ranger on the cake frosting. Here is a close-up showing all the fun! Here is the whole card front. The last step was to stamp "happy birthday" on the inside of the card using the stamp from Monkey Business set again. Good morning everyone! Like so many other places across the globe, we are having the strangest weather here. This is our dry season when construction happens all over the place because there is no rain. Yet today is the first day with sun after 10 days of rain. And winter here is in July but it feels like it started in April. Woke up today with 43F!! No heat in the house so not happy. But it will warm up soon. 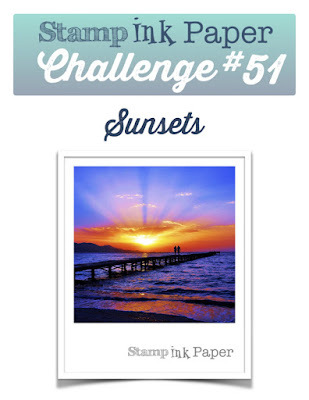 Today's card is for the Stamp Ink Paper Challenge 51 - Sunsets! 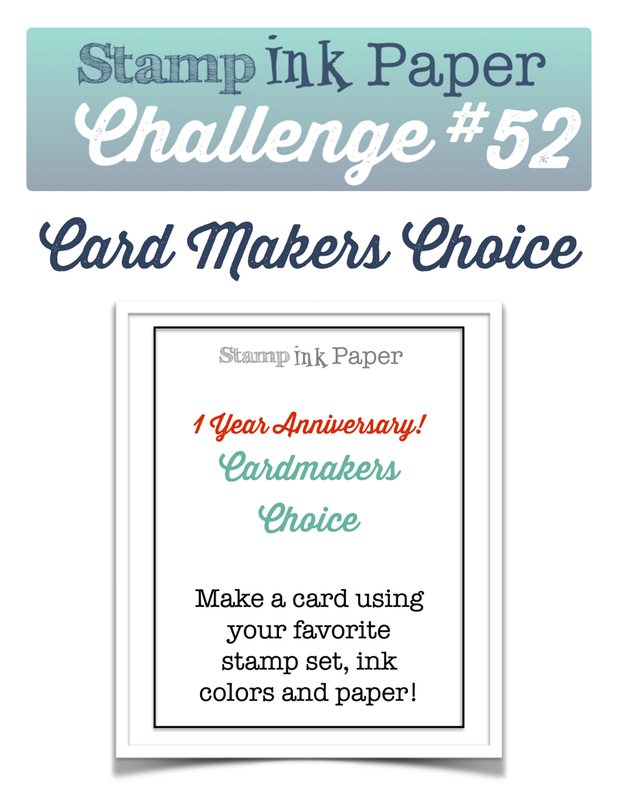 I really thought that this was a great idea for a challenge and ran to grab my distress inks to get this idea out of my head. I started with an A2 top folding white card base. 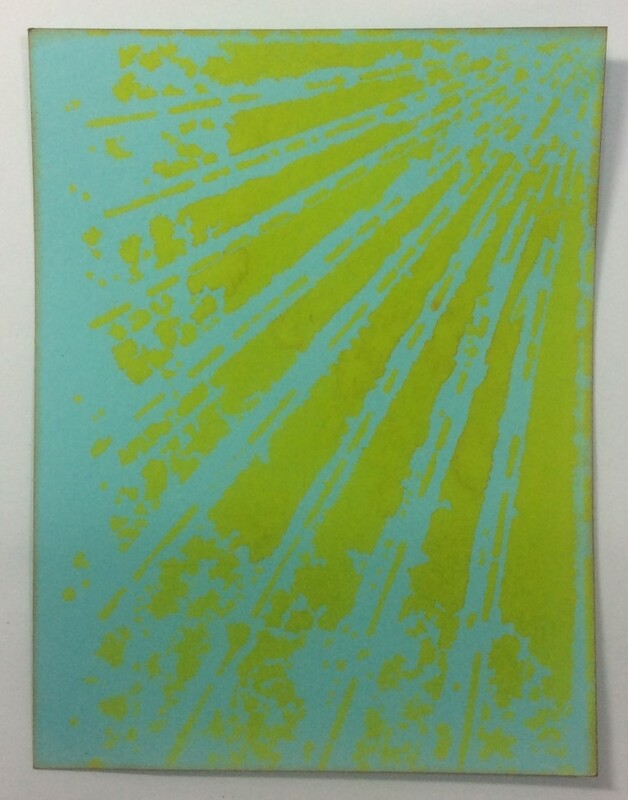 Then I grabbed another piece of cardstock (a little bigger than my image), and applied distress inks to the front. Squeezed Lemonade on the bottom, Victorian Velvet in the middle, and Dusty Concord at the top. 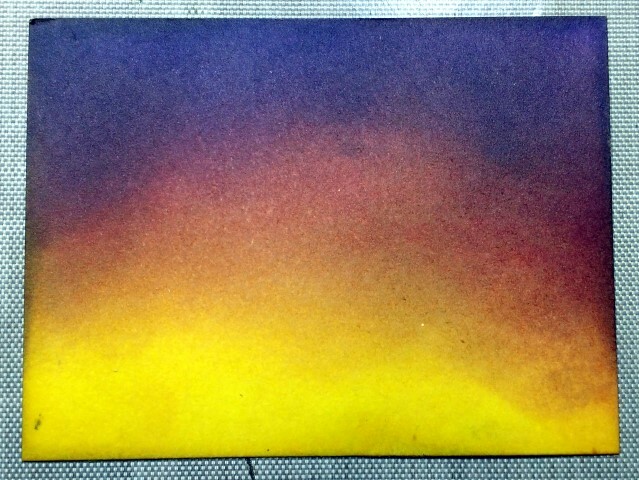 After blending them all in, I think I got a pretty good "sunset" look. Next I stamped my image, Winter Tree Pattern (K5814) by Hero Arts, with Versamark and white embossing powder in the center of my sunset. 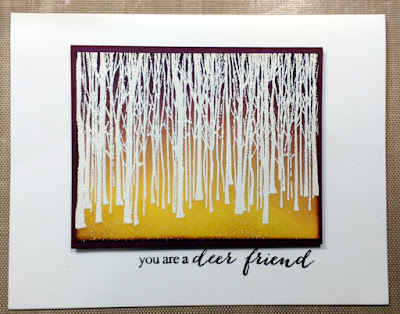 Make sure your distress inks are fully dry before applying the embossing powder! Next, I trimmed my image to 2 3/4" x 3 1/2", cut a piece of purple cardstock to 2 7/8" x 3 5/8", and adhered the image to the cardstock. Then I cut a piece of fun foam and adhered it under the purple cardstock. I wanted the image to be raised up off the card front. 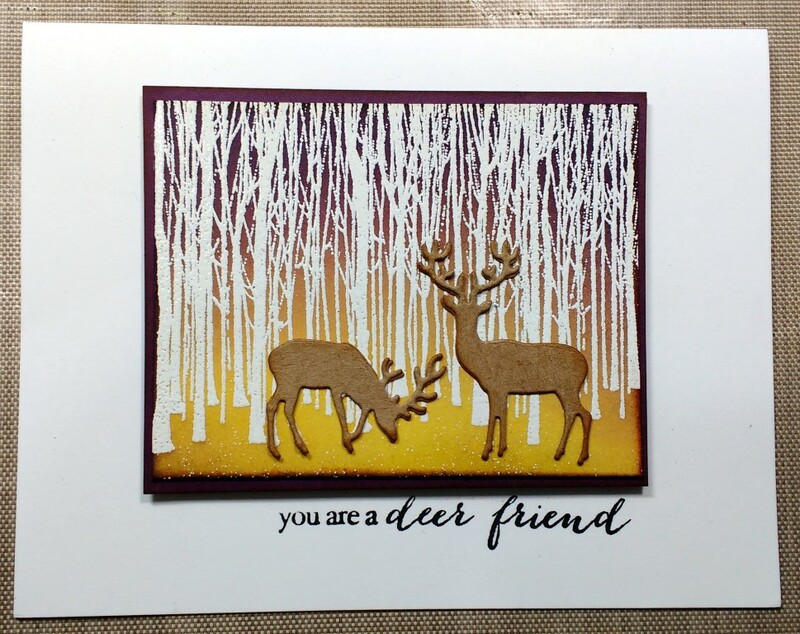 Then I stamped my phrase "you are a deer friend" from the Into The Words (CL403) by Poppy Stamps with Versafine Onyx Black. After that I adhered the image above the phrase. 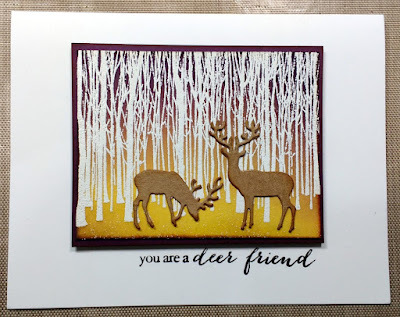 Next up I die cut from Kraft cardstock, the Small Deer die (DIE117-C) by IO Stamps and adhered them to the card front. Last step was to adhere some Polar White Flower Soft to give the look of snow. Done! 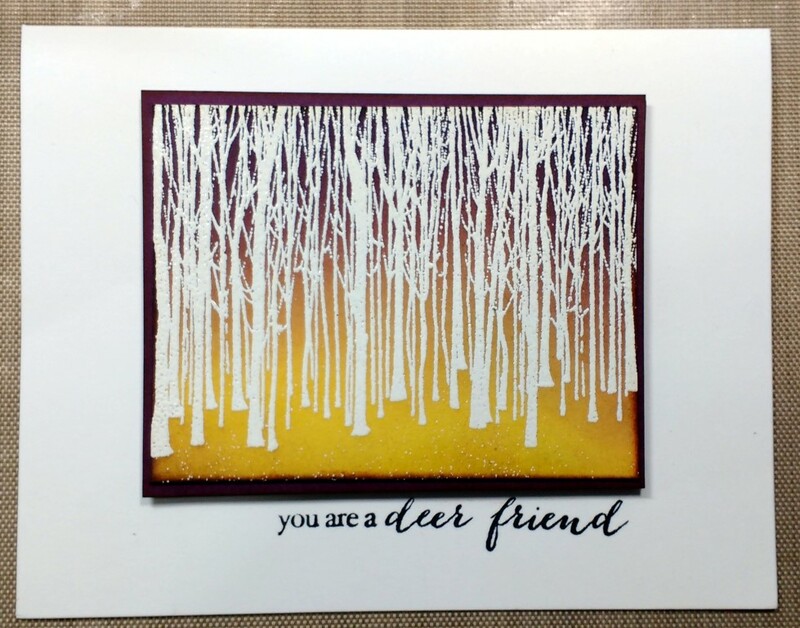 All I need to do is send this card to a "deer friend". LOL. And The Winner Is....(2 months later)....And A New Card! Hello everyone. OK...I am bad. I disappeared. Without even announcing a winner to the cards I made. I am truly sorry but just as the contest was ending I got swamped with work and completely forgot to pick a winner for all the cards I made! I had two people ask me to make a signature album for their weddings, I had 3 couples come in for me to make their wedding invites, I had one lady come in asking me to make some photo albums she wanted to give as small gifts and I had to make a travel mini album for a private class I was giving. I missed making cards!! Let's start with the winner - after printing out all the comments and folding them into little pieces, I closed my eyes and picked a winner. And that winner is.....Star a.k.a. Estrella!! Estrella...please send me your address and I will get the cards and that chocolate off to you. If you can't have chocolate, I can always send some great Brasilian coffee. Now, for the card - there is a company here in Brasil called Arte Facil Artesanto that makes the most beautiful "shabby chic" or "vintage" type papers that I just love. Most of their papers are double sided too so both sides tend to go great with each other. 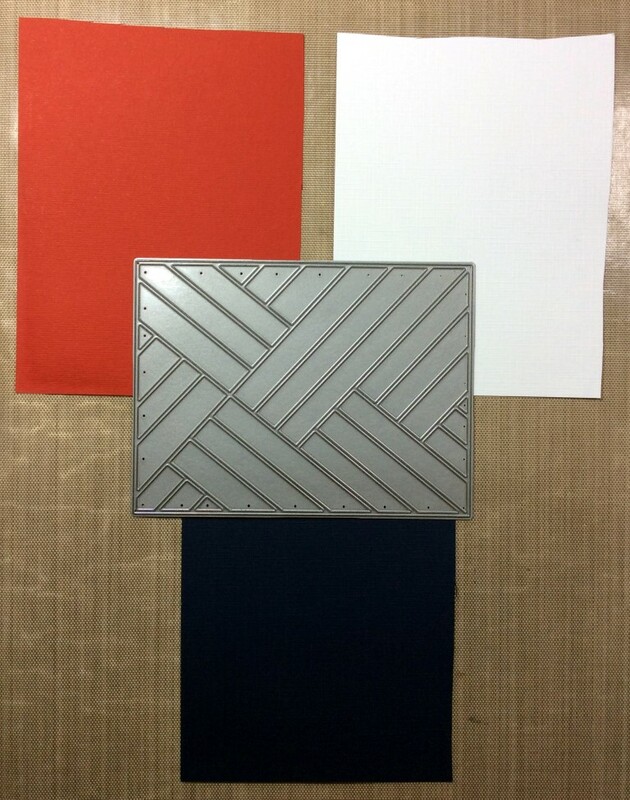 I started with an A2 piece of cream cardstock for my base. 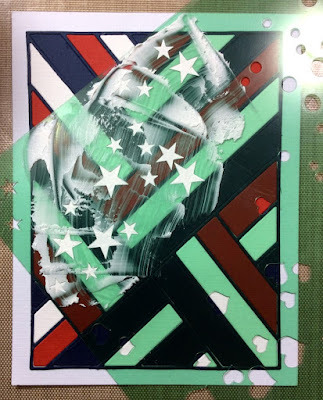 Then I cut a piece of the scrap paper (from the more subdued side), 4 1/4" x 5 1/2", distressed the edges with Vintage Photo Distress Ink and adhered it to the front of the card. Then I grabbed the "thinking of you" stamp from the "Grateful" stamp set by Concord & 9th, inked it up with Versafine Onyx Black ink, and stamped it in the lower right corner. Next I cut a piece of pink cardstock with the Custom Panels Die Set by Avery Elle, distressed the edges, and adhered it to the front so it sat above the phrase. Then I cut a piece from the other side of the decorative scrap paper (the side with the postcards) using the same Avery Elle die as with he pink cardstock, distressed the edges and adhered it over the pink - leaving a small border of the pink cardstock. Finally I adhered some 2mm half pearls along the border just above the pink border to add to the feminine shabby chic vintage feel. And you're done. I hope you enjoyed this card. Please stop back tomorrow for a card I made for the Stamp, Ink, Paper Challenge site!